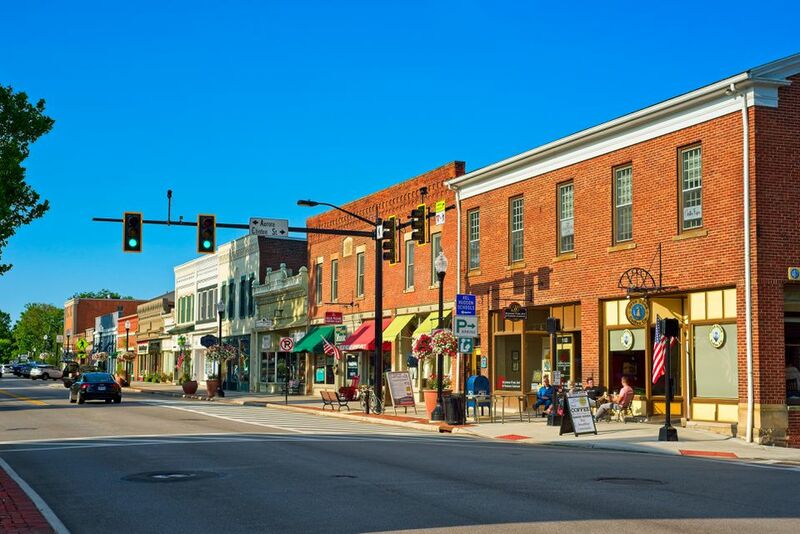 Hudson Ohio, located about 45 minutes southeast of Cleveland, is an affluent suburb, with a historic shopping district, many fine restaurants, and a history dating back to the early days of the Western Reserve. Part of the Connecticut Western Reserve, Hudson was first surveyed by David Hudson, a shareholder in the Reserve, in 1799. Hudson returned to the area in 1800 with his family and made his home there until his death in 1838. The home of the man that gave the town its name still stands at 318 Main St. It is the oldest structure in Summit County. Hudson was also the first home of Western Reserve College, later to merge with Case Institute and become Case Western Reserve University. The school's Hudson campus was reopened in 1902 as a preparatory school and continues to thrive as Western Reserve Academy today. Hudson was a vital link in the Underground Railroad in the years preceding and during the Civil War. The town still has several tunnels beneath its streets and many 19th century homes have secret rooms and passageways -- reminders of this period in Hudson's history. According to the 2010 census, 22,262 persons live in Hudson, with a median age of 39 years. A majority of the population (94.65%) is white and married (79.7%). The mean household income is $99,156. Hudson's downtown shopping district, along Main Street, is listed on the National Register of Historic Places. Among the 30 shops located there are the Learned Owl Bookstore, Hudson Rug Store, All Brides Beautiful, Jewelry Art, and the Land of Make Believe. Just behind Main Street is a more recent development, 1st and Main. This area features dozens of national, regional, and local merchants, including Chico's, Coldwater Creek, Jos A. Banks and Talbots. The city of Hudson hosts a variety of special events throughout the year. Among these are free summer concerts on the green, a Saturday morning farmers' market in the summer, the annual Taste of Hudson Festival in early September, and the annual Western Reserve Antiques Show over Labor Day weekend. The Hudson Public School System offers education for residents from Kindergarten to 12th grade. The system has been ranked in the top one percent of school systems in Ohio and the top 4 percent of US schools by Newsweek Magazine. Current enrollment (2015) is around 4,600 students. The overwhelming majority (95.52%) go on to attend four-year colleges. Hudson is also home to Western Reserve Academy (see history above), a co-ed day and boarding school for students in grades 9-12. The school currently (2015) has around 400 students. Famous Hudson residents have included abolitionist John Brown, NFL star Dante Lavelli, and author Ian Frazier. Hudson maintains 21 parks, consisting of more than 1,148 acres. Facilities include hiking and biking trails, fishing ponds, disc golf courses, picnic facilities, children's playgrounds, and volleyball courts. A complete listing of Hudson's parks and facilities may be found here.